【After-Sale Service】: If you have any product problems, please email us seller directly, we will reply and offer you a solution in 24 hours. 【Material】: 18mm E1 graded solid particle wood board, anti- scratch & wear resistance, easy to clean. 【Height Adjustable】: Height Adjustable 1-2 cm for leg, keeps stable on uneven floor. Easy to assemble, just install 4 legs with 8 screws. 【Multi-function】: can be used as office workstation, meeting desk, computer/study desk, dining table & etc. 【Computer Office Desk】It is easy to assemble with the instruction. 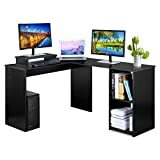 If you are on the market for a new home office workstation desk for your computer, take a look at our selection of the 6 best ones available in the U.K. at the moment. Your desk needs to be comfortable, and the correct size, with ample leg room and should fit comfortably into the available space in your home office. These desks are suitable for work or PC gaming. The Coavas L-shaped computer workstation desk is ideal for fitting into a corner of your home office. It is in sleek black water-resistant, hard wearing MDF wood material. There is enough room for two monitors or monitor and printer, plus plenty of leg room underneath. The adjustable steel legs allow you to fit it to your height. They are stable and prevent any shaking. The foot pads stop scratching and slipping on the floor. If desired you can use as two separate desks. The Coavas L-shaped desk offers plenty of space to spread out your documents or even have two monitors. The price is extremely budget friendly. It can be used as a home office desk or for PC gamers. You could even use it for two children to do their homework on. We would give this desk five stars; it ticks all the boxes as they say and the price is right. Storage place on the right for printers, etc. The Ej. Life L-shaped corner desk is elegant and fits into corners with ease. It offers plenty of working space on the desktop, as well as two open bookshelves. It is made of medium density fiberboard with melamine and veneer. It is a handsome piece of furniture that will grace any room. Waterproof, wear and fade resistant seamless patch panels. Most of the complaints are in the assembling of the product. Once you have put it together, this desk is an attractive, multi-functional piece of furniture. It fits compactly into corners and yet offers all the space you could need. It isn’t expensive and is sturdier than most and should last a long time. We think it is a good buy. The Redstone home office computer workstation is compact and will fit all your need. It has three non-lockable drawers with plastic handles, plus three shelves, so there is plenty of storage space. Its compact size ensures that it will fit comfortably into any space. The desk is strong and will hold up to 10 Kg on the desktop. You can’t go too far wrong with this compact desk; it has plenty of space for storage with three shelves and three drawers. It looks good and is ideal for your home office. It is easy to assemble and very affordable, an excellent buy. You need plenty of storage space for files, etc. You want value for money plus a 2-year warranty! The Emperor desk is fabricated from high-quality laminated MDF and is an attractive addition to any home office with extra features such as two shelves beneath the desktop, two stationery drawers, as well as an A4 suspension filing drawer. It also has a side cupboard with removable shelf for maximum storage space. The keyboard tray is retractable, giving extra working space on the desk. The melamine finish ensures it is durable, easy to clean and work on. This is an ideal desk, it is large but doesn’t take up much room. It comes with a two-year warranty, has loads of storage space and is sturdy and elegant at the same time. You won’t be disappointed with this purchase at all. It is everything it claims to be and a very good buy. The desk with drawers is 120cm wide and 55cm deep, with a height of 85cm, which allows for a comfortable sitting position with ample legroom. The built-in storage cabinet can hold a desktop computer measuring up to 41.5cm in height and 47cm deep and has a maximum capacity of 54.5cm when the shelf is removed. The Tetra home office desk will compliment any room with its elegance. There is an enormous amount of storage space with two open shelves and an additional one on top of the desk. There are two stationary drawers, as well as a side cupboard large enough to accommodate a speaker if desired. The laminated MDF gives extra strength, and there is a pull-out keyboard tray and raised printer platform. The Tetra desk has a great deal of space, but if you have a large printer, the platform may be too narrow. However, it is removable, and you can put the printer on the desktop, if necessary. 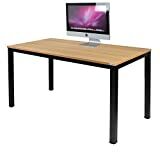 It is not expensive, is attractive to look at and will fit every need for the home office. A well-made desk at an excellent price. This is a basic, simple but gracefully designed desk which doesn’t take up too much room and will fit easily into any space in the home. The Tribesign desk is perfect if you are just looking for a simple desk which is easy to put together. It will not take up much room and is a basic design for everyday use. It is multi-functional, you could use it as a television table or for the children’s homework or just as a plain table. Provided you know what you want and what your needs are, you shouldn’t have any trouble finding the right desk for your home office. 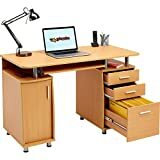 This guide will help you further by providing details of the 7 best home office workstations on the market in 2019 in the U.K.
WHERE you plan to position your desk? Naturally, this is important so that you can check the product dimensions to make sure it will fit into its allocated position. There is no point buying a desk that will not fit in with both the space and décor of your home. Decide what colour or finish you would prefer. Some desks have no storage space at all, just a simple table basically. Others have drawers, shelves or cupboards. Some have a shelf for your printer. If so, make sure it is wide enough to accommodate the printer you have. None of the home office workstations/desks in this guide are very expensive. Some are very reasonable but look expensive, some are a little more in price but have the extra features you may require. It is really a question of choice, what your needs are and how much you have to spend. Bear in mind that you should have your desk for many years to come so it is important to take some time and find one that is practical and you will enjoy owning. We hope this guide will be of help and wish you many productive hours sitting at it!